Designer Babies: Imagine a scenario where a couple go to a specialist and say: “We want an intelligent boy with dark hair, blue eyes, and a lovely smile. Oh yes, and being good at football would be nice!” Although very few people would seriously choose these options, the technology that would allow this is getting closer. American scientists have already produced a genetically modified embryo. This technology can lead to the selection of genes specifying height, intelligence, hair colour and so on. If allowed to, this technology can lead to designer babies, where parents could in theory choose the gender of their child. Genes: Each cell in the human body contains about 25,000 to 35,000 genes. Genes carry the information that determines your traits, which are features or characteristics that are passed on to you — or inherited from your parents. For example, if both of your parents have green eyes, you might inherit the trait for green eyes from them. Or if your mom has freckles, you might have freckles too because you inherited the trait for freckles. Genes aren’t just found in humans — all animals and plants have genes, too. Where are these important genes? Well, they are so small you can’t see them. Genes are found on tiny spaghetti-like structures called chromosomes (say: KRO-moh-somes). And chromosomes are found inside cells. Your body is made of billions of cells. Cells are the very small units that make up all living things. A cell is so tiny that you can only see it using a strong microscope. Chromosomes come in matching sets of two (or pairs) and there are hundreds — sometimes thousands — of genes in just one chromosome. The chromosomes and genes are made of DNA, which is short for deoxyribonucleic (say: dee-ox-see-ri-bo-nyoo-CLAY-ik) acid. Most cells have one nucleus (say: NOO-clee-us). 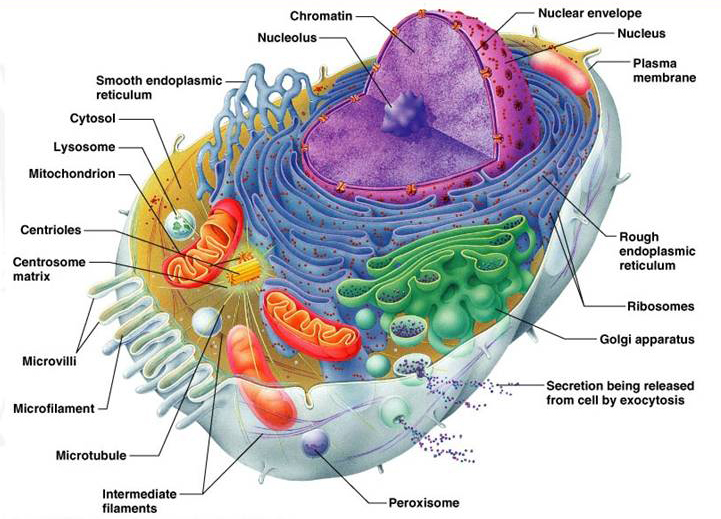 The nucleus is a small oval-shaped structure inside the cell which acts like the brain of the cell. It tells every part of the cell what to do. But, how does the nucleus ‘know’ so much? It contains our chromosomes and genes. As tiny as it is, the nucleus has more information in it than the biggest dictionary in the world and more complex than the greatest computer. Some evolutionists and atheists give the impression that the cell is a simple structure and that it came about by the random clashing of substances in a moist volatile alkaline environment. But when one looks at the complexity of the nucleus (which is only one part of a cell), it is no wonder Muslims (as well as most Christians and Jews) remain utterly unconvinced in the ‘therory’ of evolution. Muslims believe that Allah is the creator of everything that exists and that His creation did not come about by random selection or evolution, rather he created and fashioned the creation from the outset, each and every part of it. In humans, a cell nucleus contains 46 individual chromosomes or 23 pairs of chromosomes (chromosomes come in pairs, remember? 23 x 2 = 46). Half of these chromosomes come from one parent and half come from the other parent. Inside the cell, the nucleus has more information in it than the biggest encyclopedia in the world and more complex than the greatest computer! Muslim believe with certainty that this did not come about by chance. Embryo: fertilized ovum (egg) at about 12-14 days after conception (i.e. when the sperm reaches the egg) and implanted onto the wall of the woman’s womb. Designer babies: babies whose characteristics may be selected by the parents to avoid inherited weaknesses or to choose desired physical features. Human genetic engineering: the modification of gene make up, to change the features of a human. Saviour siblings: these are babies conceived so as to provide genetically compatible material for seriously ill relatives. 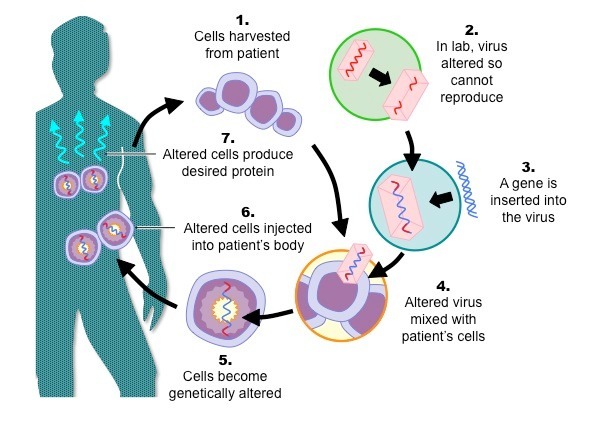 Somatic cell therapy: the repair or replacement of a defective gene within the body. Most scientists in the field of human genetic engineering insist that the purpose of their work on human embryos is to find ways of curing human diseases caused by faulty genes. It could also enable them to select healthy, disease-free embryos to implant in a potential mother’s womb. Islamically this throws forth some serious ethical questions that lead most Muslim scholars to reject this type of human genetic manipulation IF it involves creating an embryo just to carry out research and then to destroy it. However, if the research merely involves looking at a growing embryo without destroying it, then the scholars do not forbid that. Islaam has no problem with technological advancements as long as lives are not destroyed, parental identity is maintained, and the parents are married to one another. The Human Fertilisation and Embryology Act of 2008 (UK) made the use of savior siblings legal. Stem cells from the donor sibling must be collected in a way that does not harm the children. However, it is illegal to use the donor sibling for organs such as a kidney. Embryos that are not implanted in the mother have to be destroyed no later than 14 days after conception. Destroying a foetus or an embryo is not permitted in Islam. Example: Daniel was born in 2003. He was conceived by IVF for a reason: His brother (born a few years earlier) had a potentially fatal form of anaemia. After Daniel’s birth, stem cells were taken from Daniel’s umbilical cord to help cure his brother. Daniel was a savior sibling. In Islām this is not a problem, since no fetus or embryo was destroyed, and nothing prohibited has taken place. And a principle in Islamic law states that things are permitted in worldly affairs and advancements as long as there is no textual prohibition. Ex vivo – cells are removed from the patient, genetically altered and put back in to the patient. In situ – this requires cells including DNA from elsewhere to be placed directly into affected tissue. In vivo – similar to in situ but the cells are placed in the blood stream. Then they can find the ‘target tissue’ so they can deliver the new genetic material to it. This is permitted in Islam as long as no embryo is ‘grown’ for that purpose and destroyed. Technology to create designer babies is not accepted in Islam because it does not benefit mankind and may result in tampering with Allah’s creation with unknown consequences and for unnecessary reasons. Also to use this technology to select the gender leads to imbalance in societies, discrimination, and changes the natural order that Allah has created humankind upon. Explain what a savior sibling is. Do you think savior siblings should be allowed? Give your reasons. Explain what somatic cell therapy is. Use the Quranic quote in this chapter to explain what Muslims believe about genetic engineering. What do you think about technological advancements and the Islamic attitude towards them? Do you think that the nucleus of a cell could have come about by chance, randomly? Explain. I initially compiled these worksheets for my students at the Redstone Academy (aged between 13 and 16 years), Moseley Road, Birmingham, UK who are working towards their General Certificate of Secondary Education (GCSE). I felt that others who do not attend the school can also benefit from these topics since they are presented in simple bitesize chapters. I have relied upon GCSE text books and adapted them for my classes.